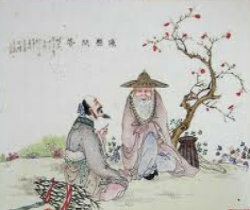 Dialogue between the Fisherman and the Woodcutter (渔樵问答, Yu Qiao Wen Da , Guqin, 古琴) listed as one of ten best ancient Chinese music pieces. “Dialogue between the Fisherman and the Woodcutter” is a piece of lyre music with smooth and melodious tunes. Its melody depicts the scene of wild geese’s hovering in the distant horizon before alighting on the sandbank. Listen more Guqin tunes? Back to Guqin (古琴) page.